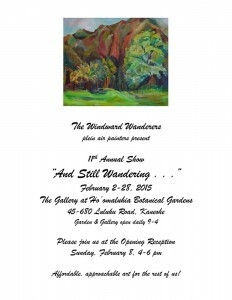 The Windward Wanderers plein air painters are holding their annual show at Hoomaluhia through the month of February. The reception is February 8, 2015 from 4pm – 6pm. Click on the image below to view a larger size of the announcement. Aloha WAG members! We have a few pieces of news from our members. This week is the last to see two of our members’ art on display: Anita Bruce is at Gallery on the Pali (2500 Pali Highway) in a show entitled, “Undercurrents of Tradition”, Sherree McKellar is showing her work in the Honolulu Academy of Art’s Gallery at Linekona (1111 Victoria Street). Both shows run until the last day of January, so time is of the essence. Marcia Morse is part of a show called “13 Women” at the Pegge Hopper Gallery until February 21, 2015. There are a few interesting art events continuing or starting in February. The Schaffer Art Portrait Challenge is now on display in Maui and runs until March 22, 2015. The People’s Choice Award will be announced on March 14 at the reception. WAG artist Jimmy Tablante was juried into the show, so make sure to look for his contribution if you get a chance to see the show. The Punahou Carnival is on the horizon, Opening night is Feb 3 4:30pm – 8 pm, and the carnival is happening on Feb. 6 and 7, 11am – 11pm. A couple of WAG members will be donating work, including Lynne Boyer and Esperance Rakotonirina. If you are a WAG member and have news, a correction or addition to what you see posted here, a show, or a workshop you would like to have posted here, you can contact Wendy Roberts (wendysroberts (at) gmail.com).